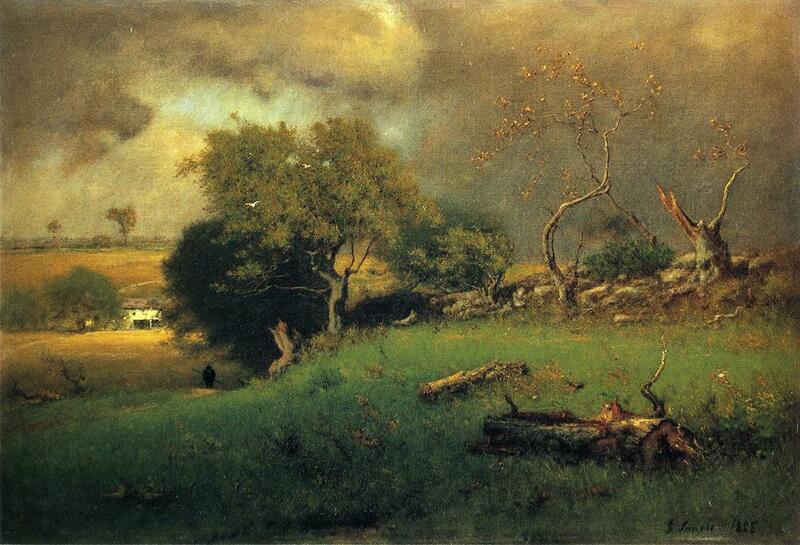 The Storm, oil on canvas, 1885, by American painter George Inness (1825–1894). Image courtesy of The Athenaeum. 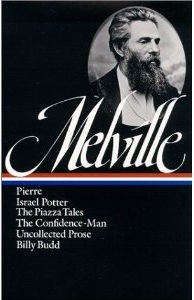 For more than a century and a half, readers have puzzled over the inspiration for and meaning of Herman Melville’s comic tale “The Lightning-Rod Man,” which one contemporary compared to “Poe in his strangest mood.” In the 1940s Jay Leyda, who performed the scholarly groundwork for much of the information that has come down to us about Melville’s life, heard from Helen Gansevoort Morewood (the granddaughter of Melville’s brother) that the story was known in the family “as an encounter that Melville had had with a real lightning-rod salesman, who chose times of storm to pursue his trade.” This interesting biographical tidbit might be apocryphal, but Leyda adds that in 1853 “the Berkshires were enduring an intense lightning-rod sales campaign, with advertisements and warnings and editorials on the subject in all the Berkshire papers.” Other chroniclers have confirmed the ubiquitous presence of peddlers selling such products across the American countryside during this decade; you can see an 1859 advertisement for a copper lightning rod (like the one in Melville’s story) here. Leyda also notes that, about the time Melville wrote this story, the Pittsfield Library Association acquired a copy of Cotton Mather's Magnalia Christi Americana, “a troubling and frightening record of religion in its most fiercely bullying and bigoted aspect.” Numerous scholars agree that Melville must have been familiar with Mather’s work, which contains a chapter titled "Ceraunius. Relating remarkables done by thunder" and includes the warning “make your peace with God immediately, lest by the stroke of his thunder he take you away in his wrath.” Thus, Melville could be portraying “a fear-instilling religionist playing the role of the peddler” (to quote the masterful biography by Hershel Parker) or, more generally, “sneering at proponents of the stern religious notion that God can strike sinners out of stormy clouds” (A Herman Melville Encyclopedia). * Dillingham’s essay on “The Lightning-Rod Man” was published in Melville’s Short Fiction, 1853–1856 (1977), pages 168–82. Notes: The Acroceraunian hills, more commonly known as the Ceraunian Mountains, are in southwestern Albania; as the Greek name (“thunder-split peaks”) implies, the region is famous for its lightning storms. Johann Tetzel (mentioned on page 762) became the Grand Commissioner for indulgences in Germany in 1517 and was accused for granting full forgiveness of sins in exchange for money, a practice assailed by Martin Luther. What grand irregular thunder, thought I, standing on my hearthstone among the Acroceraunian hills, as the scattered bolts boomed overhead and crashed down among the valleys, every bolt followed by zigzag irradiations, and swift slants of sharp rain, which audibly rang, like a charge of spear-points, on my low shingled roof. . . . If you don't see the full selection below, click here (PDF) or click here (Google Docs) to read it—free! Found the story amusing even though I was reading it for the second time. The peddler walks in to the narrators's house avoiding pine trees,"high houses, lonely barns, upland pastures, running water, flocks of cattle and sheep and crowd of men. if I travel on foot, as today - I do not walk fast: if in a buggy, I touch not its back or sides, If on horseback, I dismount and lead the horse,but of all things, I avoid tall men." Hilarious and comic and ridiculous!The peddler standing in a pool of water in the middle of the room while the sky outside is breaking apart with thunder and lightening, trying his sales talk heightens the the drama,to say the least. I enjoyed the article and informative links. Thanks! In the first paragraph you mean Jay Leyda, not John. Scott: Thanks for pointing out the error, which we've now corrected.